in a pool of red booze. from limb to see it. celery is the serious one. No one paints a still life of celery. 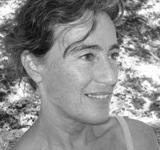 Katharine Harer is the author of six collections of poetry and often performs her work with jazz musicians. A community college writing teacher for more than 30 years, she enjoys baseball, jazz, swimming, and growing vegetables in the backyard. Mother of a grown son, Katharine lives in San Rafael, California, just across the bridge from San Francisco, where she grew up. What a lovely, funny, fresh look at celery! I will never see it the same way again. Thank you. A late word of praise and thanks from a celery-lover in a household where most of the shopping is done by one who loatheth the wonderful vegetable! Let's hear it again and again for celery! YAY!! I loved your poem. Perfect! I love celery in a Bloody Mary. Now I love it even more! Well done! Thank you, Katherine. Only now I'm craving tuna salad with celery. Readers who enjoy this should check out the food odes by Kevin Young. Clever! My husband loves celery. I tolerate it. A delightful look at the staid celery. It got my morning off to an entertaining start. Jane Eva, we want to see the finished painting! I think you've nailed it! We're all celery at some point in our lives. Imaginative and deftly phrased--a nice way to start the day. Wish I could paint it! Stunning perspectives into a not oft' celebrated veggy. Delightful poem.Thanks, Katherine. Just wonderful! One of my favourite vegetables and so brilliantly celebrated. . . . . and in honour of you Katherine I shall paint this noble and delicious plant. This poem astonishes me! It is a WOW! Thank you Katharine.